He was born in Diest, Belgium, in 1599. After a period of uncertainty about what form his spiritual vocation should take, he read a biography of Saint Aloysius Gonzaga and chose to enter the Society of Jesus. He died in Rome in 1621. He is buried in the chapel of the SS. Annunziata. 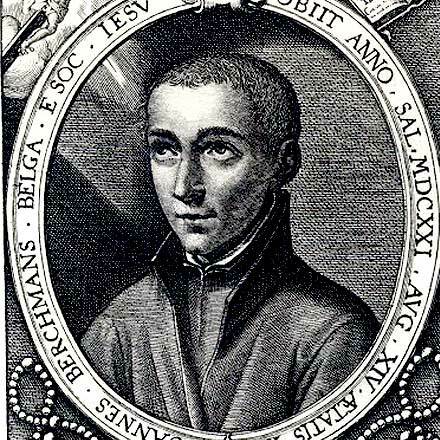 John Berchmans lived his faith with strong and genuine realism. His is a joyous spirituality, one of freedom, love, joy and serenity in the Lord. He received his education as a child according to the doctrine of the old mystic school of the Netherlands. When he entered the Society he blended his education very well with Ignatian Spirituality. Towards the end of his life, after a period of spiritual aridity, John received the grace of a mystical experience and a heart full of God. The relic of his heart is kept in the Jesuit church of Saint-Michel in Leuven.